Article led by Donna Cromeans (@DJRiter) with contributions by Aimee Hicks, Jamie Coudeville, Bex Wright, Gina Kern, Jessica Lerner, & Claire Serowinski. Article edited by Donna Cromeans. Article prepared for publication by Aimee Hicks. For all their differences, successful shows on television have one very important thing in common. They all have a performer/character that serves as the heart and soul of the show. A performer or character with whom everyone reacts and most want to know or protect. Such characters can be leads or supporting characters, but they are the one around whom the emotions of a show revolve. 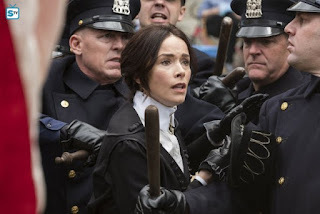 For Timeless, that character/performer is Abigail Spencer as historian Lucy Preston. She is the true center of the Timeless universe. She's the one others turn to for historical accuracy. She's the one the other characters want to be around, protect and support. She's also the one they know will be a fierce defender of the history she loves and the people she cares about. There was no truer example of this than the episode Mrs. Sherlock Holmes (2x7). Abigail Spencer gave us all those sides to Lucy in this episode. Lucy was fierce; Lucy was concerned about rewriting an important part of women's history; but she didn't let us forget that Lucy was also a woman in conflict, torn between her heartache and her honor. 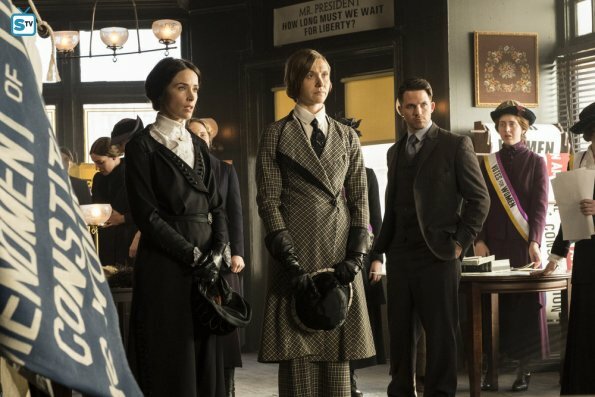 By taking a look at some of her best moments from the episode it will not be hard to come to the same conclusion reader's did, that Spencer's passionate and well-rounded performance in the episode focusing on the Women's Suffragette movement deserves the title of SpoilerTV Readers Choice Performer of the Month for April. The episode opens with a jarring moment for fans of Lucy and Wyatt. When we'd last seen Lucy, she was knocking on Flynn's door late at night, seeking solace from the pain of seeing Wyatt and his wife. Any morning after is awkward, whether or not anything actually happened. Of course, a lot of Spencer's acting in this scene is to make the audience wonder what happened that night. But of course, Lucy would feel weird the next morning. She's not used to confiding or being close to Flynn like that, not used to him seeing a more vulnerable side of her. So, Spencer's awkward stares and smiles make a lot of sense. Arriving at a critical time for the Women's Suffragette movement in 1919 strikes a chord in Lucy. For a moment she forgets what it was like for women before getting the right to vote. Spencer plays a confident Lucy, a character leading her team through the hotel. When the boys argue about who will take the lead, Lucy strides away to get the information and the myriad of facial expressions that Spencer shows in this brief scene as Flynn is told to "control his wife" reminds both us and the character of the time she is in. After hearing of Alice Paul's arrest, she doesn't need dialogue to convey Lucy's concerns at that moment. There's a subtlety in the changing of her features that express everything clearly. When she does recite the lines, it's with conviction, and in those moments we all share Lucy's passion for these historical figures. Spencer also brings a touch of humor to that moment in the scene where Flynn and Wyatt once again argue, keeping her character classy and patient, with just the right amount of light-heartedness to rein the boys in. Lucy may be the woman in a man's world in 1919, but she remains the leader of this team and her flawless portrayal reminds us in every line delivery, in every shift of expression, in how boldly Lucy carries herself, that Lucy never had to fight for respect at Mason Industries. She had it from the start. Later as Lucy and Wyatt walk into the police precinct to get to Alice Paul, the historical figure they believe to be the key to their mission, Spencer doesn't hesitate upon proclaiming to be Alice Paul's lawyer, Ally McBeal. Despite the officer's initial reluctance to let Lucy and Wyatt see Alice, Lucy doesn't back down. She continues to stress Alice's innocence, even though the evidence is pretty damning against the suffragette. While viewers have come to expect Spencer to consistently portray a strong female character, who is fearless and determined, her nuanced performance in this particular scene should be praised, specifically due to the time period. 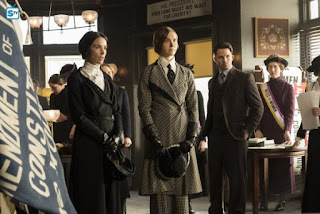 The early twentieth century saw women fighting for their right to vote, and Lucy, who had the luxury of growing up in the late twentieth century and coming into adulthood in the early twenty-first century, simply doesn't cower at being dismissed by the male officer but uses his reference of Sherlock Holmes to her advantage. As soon as the name of the famous literary icon is mentioned, you can see the wheels begin turning in her head, as the throwaway comment brings the realization that Grace Humiston, also known as Mrs. Sherlock Holmes, works at this very police precinct and could be the key to freeing Alice Paul. Upon meeting Grace Humiston, Lucy can't help but break into a smile. It is here, that Spencer softens, an almost palpable joy as Lucy meets a woman she greatly admires. However, the shift on Lucy's face as Grace correctly reads the awkward romantic situation between Lucy and Wyatt is instantaneous, almost as if the reaction is real. Despite being thrown that Grace is attuned to her personal issues, Lucy doesn't let that stop her from focusing on the task at hand. Spencer then does a masterful job at balancing Lucy's fangirling over Grace with her commitment to getting Grace to help Alice Paul. Even in the presence of such a dominating figure, Lucy stands her ground, same as she did with the police officer. No matter who or what Lucy comes up against, Spencer continues to portray Lucy as an empowered woman, who won't let anyone or anything stop her. It's in the scene with Alice Paul that Spencer easily reminds the audience that meeting these historical figures will never get old for Lucy. She plays Lucy's awe and admiration to a level that keeps the character from going into full fangirl mode. She delivers the lines with a breathlessness viewers can relate to upon meeting their own heroes. When it comes to convincing Alice Paul, there's a softness in Spencer's voice as Lucy treads carefully, only strengthening her voice towards the end of the scene as three stubborn characters face off against one another. Spencer brings that firmer tone at the perfect point in the discussion, and then again brings a little humor with the facial expressions and little noises she makes after Grace leaves the room. In this one scene the viewers see many different parts of Lucy's personality and they all transition smoothly, never jarring as Lucy moves through the different emotions and reactions. The chemistry between Wyatt and Lucy has always been intense and visceral. Spencer's performance in this scene shows all the emotions of being in the unwinnable situation they both find themselves in. Her ability to portray her connection and pick up on what is going on with Wyatt makes the scene real. The annoyance she shows further pulls you into the conundrum that is Lucy and Wyatt, their unrequited love for each other, Wyatt's surprise wife coming back from the dead just as they were finally connecting. Spencer's performance gives credence to all of these things. Her intensity in this performance also helps show her angst at the situation, and at that moment her annoyance with Wyatt. Later, the moment Lucy and Wyatt find Alice dead you can see the sheer panic on Spencer's face. This isn't the first time they've lost someone on a mission but losing Alice could have a huge impact on the present day. And as a historian, no one would know this better than Lucy. Spencer did a fantastic job showing just how serious this is with the break-in Lucy's voice. Lucy just saw her rights as a woman go up in flames. That is why she's so aggressive in her argument with Grace. When Grace leaves the room, you can clearly see both the disbelief and frustration. Spencer shows that Lucy is starting to lose hope of fixing this. But, as Lucy has done on many missions before, when it appears history will lose, she digs deep with a rich, visceral moment like occurred when the team had to inform the suffragette's that Alice was dead. Spencer's passion, desperation, and need for Alice's legacy to continue was awe inspiring. Her performance showed Lucy's love of history, and how this moment changes everything for women in the United States. She started off meek, and as thing progressed, her passion and determination came through in colors. She brought this moment to life in every way. When the suffragettes agree to go on, she has hope again for a moment. But that is dashed when Grace calls for a vote on whether or not to continue Alice's fight with a whimper, not a bang. Spencer was magnificent at the moment she berated and called Grace out. Her use of her hand, saying I don't want to hear it to express her disappointment. This was truly her scene as evidenced by her intensity, and the use of her intellect, and her passion. She went for it and committed a hundred percent to this moment. Her intensity grew stronger and stronger, finally reaching a crescendo when she said, "if you're not going to help Grace, then get the hell out of the way", then decides that she'll give Alice's history-turning speech. It was great to watch how she embodied the moment in every way. It was easy to forget you were watching a TV show, instead of a deeply impassioned woman. In the end, when she went from soft Lucy and in a blink of an eye to intense Lucy was great acting. Lucy departs the headquarters a woman on a mission. Wyatt tries to catch up to her and try and talk her out of her actions. Spencer perfectly portrayed a woman on a mission, from her brisk walk to her focus on where she was going. For the scene to go from this to Lucy telling Wyatt, "I'm trying to be a good person in this horrible situation, but you're not making it easy", was awesome. With just a few brief gestures, expression and pointed lines of dialogue she was able to convey Lucy's strength, anger, vulnerability and her hurt heart in what was possibly one of the best scenes of this episode, and maybe the whole season. The way the two actors react and counter-act in this scene was great. And the way she told Wyatt off, then said she had a speech to deliver and turned around and walked away showed was the definite definition of Lucy was on a mission. However, Lucy's mission gets interrupted when she is grabbed by one of the women from the march, who it turns out was the Rittenhouse sleeper. Lucy's physical reaction, of making a shocking noise when the sleeper grabs her and points a gun at her really started the scene off right. Spencer's performance was in that moment, reacting to being in danger, to her shock at who the sleeper agent was helped sell the moment. Whether expressing shock, fear or defiance the performance was truthful and real. In the rally scene where Grace eventually gives the speech that will sway President Woodrow Wilson on suffrage, there is pandemonium as Lucy, Grace, Wyatt, Rufus, and Flynn must deal with the police physically assaulting the suffragettes and throngs gathered. But it is in these few moments where Spencer shines again. With the look of complete anguish on her face as she realizes that if Rittenhouse is allowed to change this one moment, women's suffrage and all that came after it could be wiped away forever. She falls to the ground in the mele' only to be helped by Wyatt. She screams in vain for President Wilson to hear her and listens raptly and with such a deep pride as Grace steps up to deliver a beautiful message of justice and of expecting no less for all of man's sisters, mothers, wives, and daughters. She deftly portrays Lucy as a strong, modern woman who knows and reveres history for what it truly is and how the past, present, and future are all so closely interwoven. And it almost feels as if Lucy more than any other character becomes a real part of the past. She embodies and embraces it and is the moral compass of the group. She is the leader of the lifeboat. But it was upon the end of Grace's speech where Lucy passionately declares: "she did it, she did it!" And Wyatt responds: "No, you did it" that was the most moving part of the episode. With just six words, she expressed so many young girl's and women's desires and dreams of what the future held for the women in the early twentieth century. 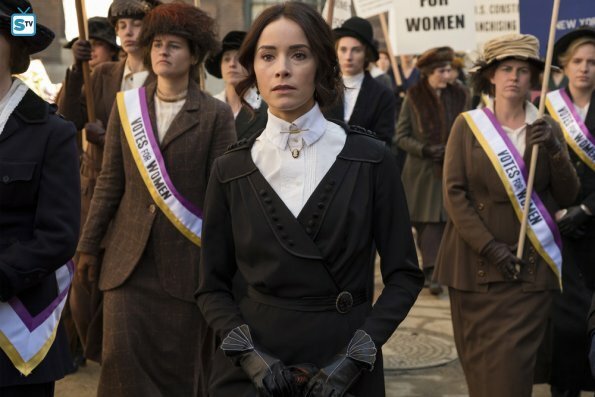 Abigail Spencer is a true acting force of nature. Time and time again throughout Timeless's two-season run she has proven that. While this entire episode gave her a lot of incredible material to work with, it was what she did at the end of the hour that left the biggest impression. She pulls out all the stops to deliver some very powerful and memorable performances. As the group returned and exited the vehicle Lucy witnessed Jessica rush up to Wyatt and passionately kiss him. He's not really into the kiss and Lucy can see that, but that doesn't change anything. It hurts her for her to see them together, but at the same time, she knows it's the right thing. It was beautiful acting by Spencer because with just a tiny flicker in her eyes and a rigid change in body language she conveyed so much of Lucy's pain. Then, like the flip of a switch, she went back into work mode without missing a beat. She questioned Denise about the election and very nonchalantly declared that she didn't know if the election was meant to happen the way it did, but that "it wasn't us". There was this brilliant bravado in the way Spencer declared that line that it was hard to not laugh or smile at that moment. The final scene in the episode was a profound moment for Lucy. It was when she had to finally fully accept the reality of Jessica and Wyatt while also letting go of him. Spencer made a brilliant acting choice to play Lucy very blank and lost in thought at the start of the scene. This moment was about more than just the mission they had completed. This was more than just Wyatt and Jessica. This was a moment where so many complex feelings and realizations came to a head. As Wyatt came over to try to reassure and comfort her she brushed him off and put distance between them. Spencer and Matt Lanter have had an amazing chemistry from the very beginning. They are both very giving performers who work so well off of one another, but at this moment with their characters so disconnected, they were still more connected than ever. Despite the issues, their characters were experiencing through their beautiful heartbreaking performances the audience could tell how much love each character has for the other. Spencer played Lucy very stoic at this moment but through her expressive eyes, one could see the pain seething just under the surface. Spencer tried to keep her voice steady to show Lucy's commitment to letting Wyatt go, but at certain moments there were little catches in her voice or a waiver to her tone. All around it was a beautiful feat of acting acrobats to ensure that every moment of this complex scene played perfectly to what her character was going through. It was a truly brilliant way to end the hour on such a character-defining moment of heartbreak and hope. Spencer brilliantly portrays Lucy Preston as a time traveler who embodies all that is good with the world and is trying in vain to right the wrongs her family legacy has left on the world. This is not an easy task, but Abigail Spencer does it so beautifully and makes it look seamless and natural as she brings Lucy vividly to life. 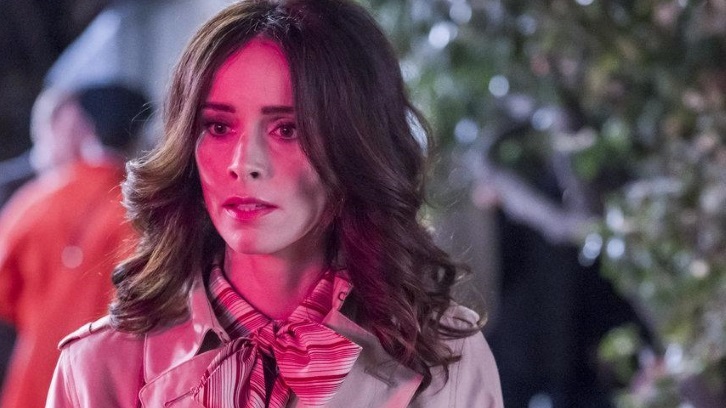 In Abigail Spencer's portrayal of one can feel the palpable fear, agony, relief and eventual joy which she must convey as Lucy Preston, often with very little words. She is capable of volleying between pain and pride in a matter of seconds without words. She makes one believe everything that Lucy does comes from her heart and her love of history, Wyatt, and the team around her. This article cannot cover every moment of Abigail Spencer's performance in the Timeless episode, Mrs. Sherlock Holmes (2x7), that earned her the honor of SpoilerTV Reader's Choice performer of the month. Discuss your favorite moments in the comments below.